If you haven’t read this blog yet, it is the continuing saga of recovery from Post Tibial Tendon surgery which occurred on January 14, 2014. 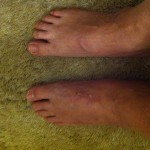 I began the blog a few days following surgery. My last post had me itching all over from a blood thinner medication I was taking for a small blood clot found in my left calf following some cramping in the same location. 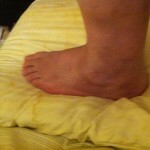 I also reported that I was up and walking with my boot and was placing 90 pounds on my foot with each step. This meant that I was using one crutch, but walking with weight on one foot. That’s a long ways from walking with two crutches. A great deal has taken place since the last post. After my physical therapy I took my new brace home. Later, I did the exercises with my brace on my foot. 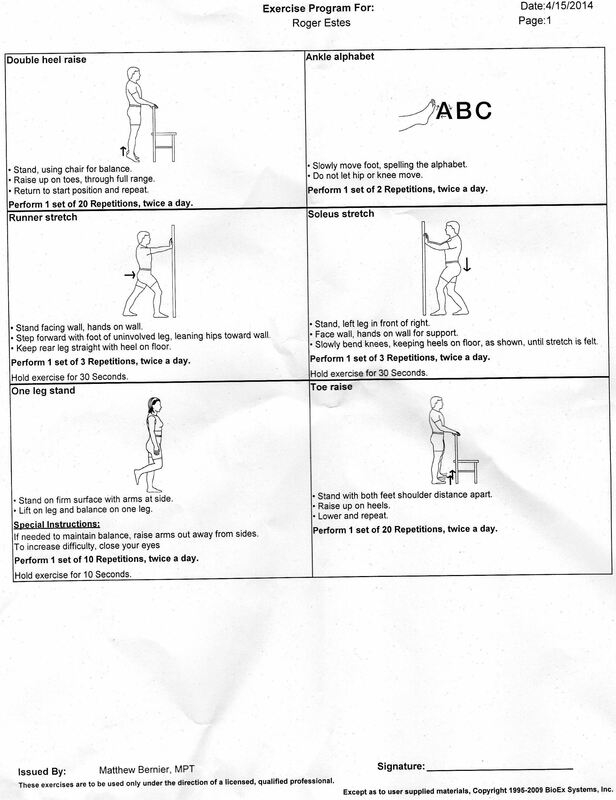 Saturday morning, I did my new exercises with my brace on. I wore the brace most of the day. Late in the evening I removed the shoe with the brace in it. Something inside was loose. It was the heel, which is removable as there are interchangeable heights as well as interchangeable insteps. I checked the brace and attempted to replace the heel. This was not to be. The heel had tips on the bottom which corresponded to holes in the brace. The tips on the heel were peened over and wouldn’t fit back into the brace. The end result was that I couldn’t use the brace any more of the weekend. Consequently I had to return to the boot. Today, 4/15, I had another physical therapy appointment. Upon arrival the therapist examined my brace and went immediately and got another one for me. Now it was time for new exercises with the brace. Oh yay… First exercise was the horizontal leg press except instead of the entire legs pressing, the press was only the toes. So I would place my feet at the bottom, hanging the heels off the lower edge. Push off with both feet, stretching the calf muscles in both legs, then remove the right foot and allow the left foot to move back so the heels were below the edge of the floor of the machine. Do this 45 times. Actually Julie, my therapist made it sound much easier. “Just do 3 sets of 15. It’ll go much easier.” Beats me who told her that. There was Nothing easy about that exercise!! Next was the step over. That’s done by stepping up to a 4″ step with my surgered foor and step over to the floor on the other side of the step with my right foot. Do this 20 times. This isn’t really hard. Following this was marching: This involves lifting the legs high so the thigh is more than parallel to the floor, step out holding up the leg at least two second. Do this twice down & back in a straight line about 12 feet long. Next exercise is one of the most difficult of the day. Julie placed on the floor, a length of foam, about 3 inches high x about 8 inches wide by about 8 feet long. My exercise for this was heel to toe walking forward to the end, then heel to toe backwards to the end. Did this 5 times forward, 5 times backward. 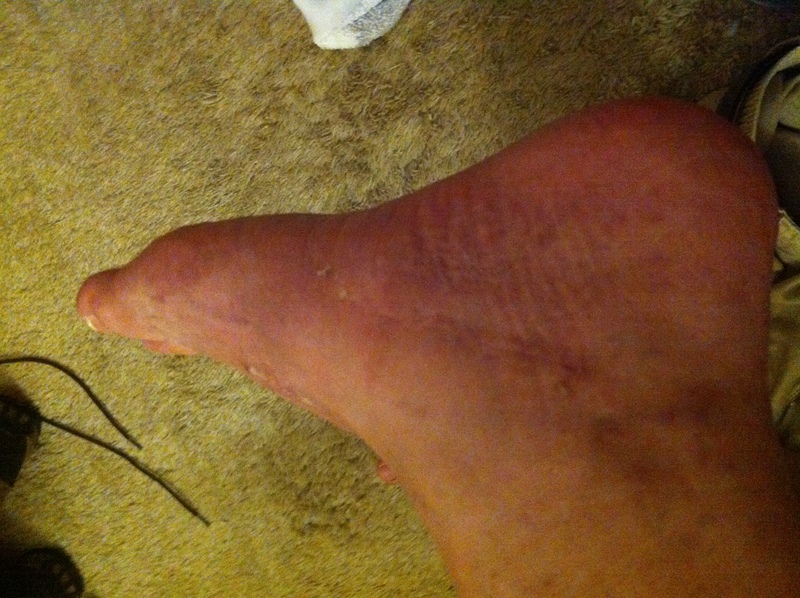 The foam made the walk wobbly and if the ankle is weak, like as not the walker would have to step off. I only made one forward walk without stepping off. The rest of the time was step on, step forward, step off or nearly fall off. It was concentrated fun though. Next exercise seemed easy. It was standing on the surgered foot for 10 seconds – 10 times. I quickly found that nothing is easy here….let alone standing in one place! I only made one complete 10 second time period. The rest of the standing I was lucky if I could get through 3 seconds without dropping my ok foot down, or nearly falling. After this was the standard leg press – except it was done only using my surgered foot. This had a 100 pound lift with this one foot. The therapist uses the Wii system and the Wii Fit Plus video with the Balance Board. They use several games as well as posture and yoga to exercise with. Today I did a certain movement where the arms are raised and the heels are raised. All I could do with stand with my weight on the balls of my feet. I can’t raise my heels off the floor yet. Later in this same exercise the arms are lowered then both placed back and keeping the back straight while keeping the heels up as far as possible. Did this three times. A hard exercise. This was the end of the exercises. Now for ice. 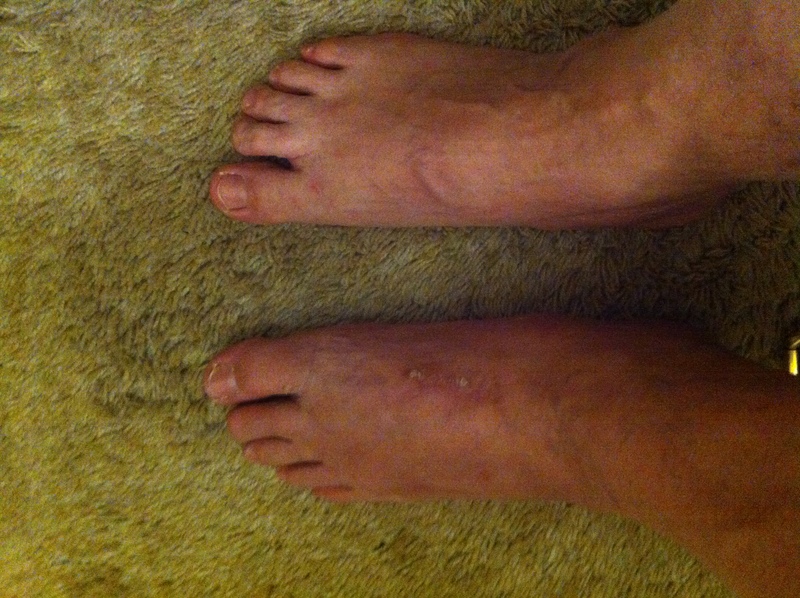 Ahhhhh…..The therapist placed my poor foot in a cordura boot which she closed with velco. Then a water hose is connected at the top of the boot and cold water is run through small hoses that go in and around the boot. What a wonderful feeling after maximum exercise. By the time this is done I feel like a L O N G nap is in order. The therapists told me to use my new brace inside my house and the boot on the outside still. I had hoped to graduate from the boot this week. That was disappointing. However, the therapist did give me permission to use the stationary bicycle for cardio exercise. But he also advised me to not set the bike to high number for pedaling, but low, so I can spin it up to get my heart beating faster. But at least I can begin doing cardio exercising again. 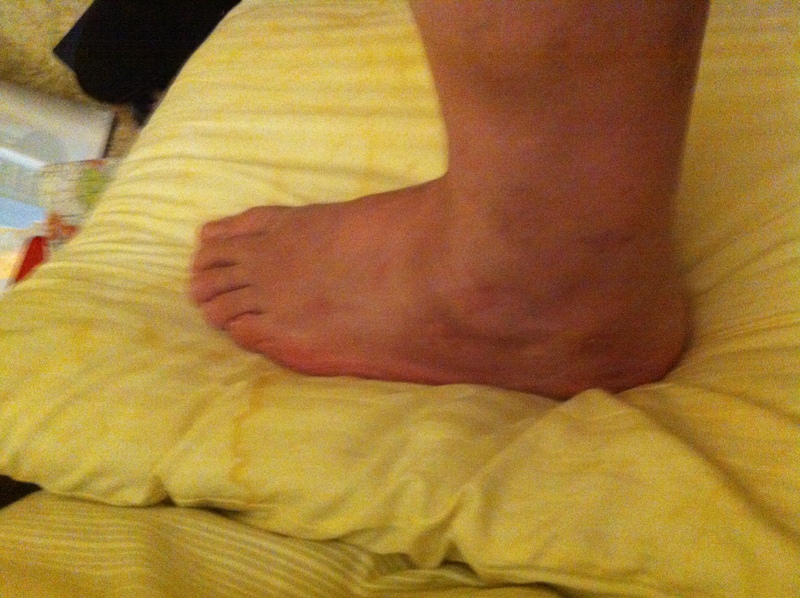 After all, I’ve not done any since just before November, 2013 since my foot began to hurt awfully. But, the good thing is now I no longer have pain, and I can exercise. YAY! !